#Aww: The Groom Says The Most ADORABLE Thing About His Bride! You know all of those wedding videos that leave you feeling like you were actually there? Well, this one by The Photo Diary is a bit different! It makes you WISH you were there for it! 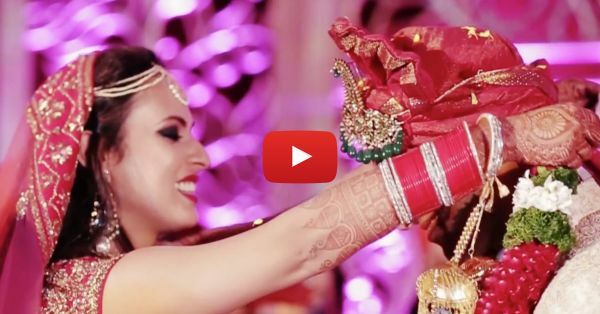 With all the funny stories and the inside jokes, we can't help but feel like this wedding wasn't just another shaadi but an experience of a lifetime! This is the story of a groom who went through all the tests that a bride's friends are bound to put him through and a bride who is SO sweet that the groom's friends couldn't believe that she chose him! Together, they planned a wedding no one would forget. And believe us, they definitely succeeded! PLUS: Subscribe to POPxo on YouTube for original videos + our favourite videos from around the web! MUST-READ: #Aww: This Beautiful Couple Shows Us The True Meaning Of Love! MUST-READ: #Aww: This Couple Is Totally Crazy – And Totally In Love!